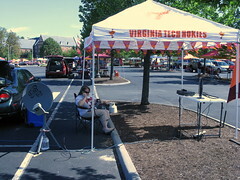 September 27, 2008 by Alphageek in "alphageek bourbon tailgate virginia tech dishnetwork dish network honda generator"
Tailgates! What a great concept. You go to the game and hang out in the parking lot for several hours before the game, soaking up a great game day experience. Mrs. Alphageek demonstrates the best way to enjoy a tailgate in this great photograph. There are a lot of things you need for a great tailgate. The very first thing is a favorable kickoff time. Noon kickoffs are no good for a "big deal" tailgate. A big deal tailgate requires a later kickoff to get everything set up and to enjoy what you have set up. There is no point in trying to watch "College Gameday" before a noon kickoff, unless you don't mind missing your kickoff. If you mind missing your kickoff, please logoff and wait for my next post. You are not worthy to read the rest of this post. Ok, since you are still here, I guess you think you are worthy of this post. I find there are several things that help make a good tailgate. I decided to go in chronological order and describe what we use to tailgate and the order in which we acquired the items. I like to start out with the most important ingredient: Wild Turkey. Get some for your tailgate, and things will go more smoothly. You might mix it with some Coke, but I find WT is pretty good over a couple of ice cubes. You will need something to eat. After all, you need to get there by 10 am for a 3:30 pm kickoff. You will need sustenance during the long day. I purchased a small grill with a cover. You will want the cover for windy and rainy conditions. After all, if the food takes hours to cook, you will have a group full of tailgaters ready to leave your event for the multitude of tailgates nearby. Don't forget a table or two for cooking and eating. Chairs help too. Oh, and you better put your food in a cooler, or you may have to go to the hospital for food poisoning. Next, we purchased the tailgating tent. This provides cover during both rain, and also the sun. After all, you are covering the time from August until December, so there will be a variety of weather conditions you will need to deal with. The tailgate tent is very effective during even a hurricane! Mrs. Alphageek got tired of the hurricane and made us sit in the car. After this event, we realized that we needed to purchase the sides for bad weather. The sides are great for both rain and wind. Who wants to cancel a tailgate due to weather?? At this point, you have a pretty basic tailgate. This will suffice for most people, but not the Alphageek. A friend and I attended a game and asked "what would we need to watch satellite tv"? We walked around and looked at some of the satellite tv setups. It became clear that the first problem was the dish. I purchased a tripod to hold the dish up. Then the next problem is power. I guess you could try to share power, or run an extension cord from a building, but that probably is a bad move. If you want power, you need a generator. You need quiet power, so you will need to purchase a Honda generator. Honda makes the quietest generators out on the market. I recommend a flat screen tv because of the ease of moving in the car. With this setup, we can now watch ESPN Gameday right in the parking lot. Now, just sit back and enjoy. It is a blast to sit in the parking lot and eat food. You should stop by sometime. I put up a slideshow from the last big tailgate at the end of this post. Unfortunately, I think there is only one more chance at a late kickoff this year, so you may not see the Alphageek setup until next year! "alphageek bourbon tailgate virginia tech dishnetwork dish network honda generator"